Match Report: 5th Round of NWASAC Personal Members Championship 2014, George Crane Memorial Match, Sat 14th June, Rock Channel, New Brighton (22 rods). Fish were taken from the start of of the match as the tide ebbed at this low water channel at the mouth of the Mersey and again on the flood. Species caught were mainly dabs, flounders and plaice to peeler crab bait. It was a good day for the Lindfields with series leader Bill consolidating his championship position with a win from downriver Zone A and Heather’s fourth, second in Zone B, moves her up to joint second in the points. Ian Brookes’ Zone B win gave him runner-up place. Third placed John Williams lost a dogfish on the retrieve towards the end of the match; although it would have been unlikely to have improved his position, it would certainly have won the roundfish pool. 1. Bill Lindfield (Greasby), 565 pts., 16 dabs, 4 plaice, 3 flounders, 1 codling (Zone A). 2. Ian Brookes (Birkenhead), 507 pts., 10 dabs, 8 flounders, 1 plaice (Zone B). 3. John S. Williams (Prenton), 304 pts., 6 flounders, 4 dabs, 1 plaice . 4. Heather Lindfield (Greasby), 456 pts., 8 flounders, 4 plaice. 5. 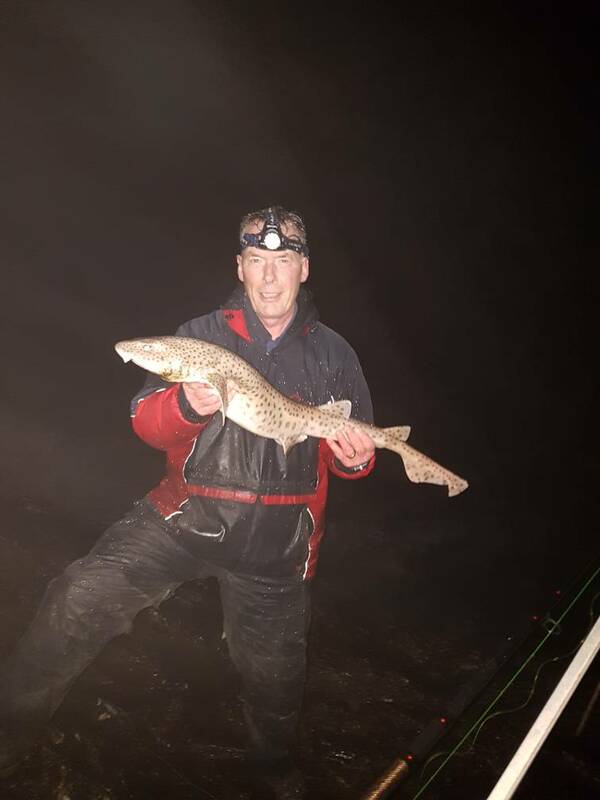 Norman Dorling (Prestatyn), 277 pts., 5 plaice, 2 dabs, 1 flounder. 6. Phil House (Wallasey), 394 pts., 12 dabs, 3 flounders, 2 plaice. Roundfish Pool: B. Lindfield, codling, 24 cms., 140 gms. Flatfish Pool: Danny Connolly (Leasowe), I. Brookes & Phil House (Wallasey), all flounders of 40cms., 740 gms. 1. B. Lindfield, 117 points. 2. equal Joe Perry (Litherland) and H. Lindfield, both 102. 4. Ian Griffiths (Eastham), 98. 5. John Waugh (Wallasey), 94. 1. B. & H. Lindfield, 219 pts. 2. Carl Edwards (Bootle) & J. Waugh, 166. 3. John Baguley (Wallasey) & I. Griffiths, 160.